I like to use larger pieces of venison for this recipe; pictured is some backstrap from a red deer. This is ideal for elk, caribou or moose, but it will of course work with regular venison backstrap as well. For non-hunters, use filet mignon or boneless lamb chops. Maitake mushrooms are available in bigger supermarkets; they’re being farmed now. But no biggie if you can’t get them, as regular button or cremini mushrooms work just fine. The porcini powder I roll the venison in adds a lot of flavor — you make it by buying some dried porcini and blitzing them in a coffee grinder — but if you want to skip that, I won’t be mad at you. I will be mad at you if you don’t caramelize your onions. It’s what really makes this dish. Follow my instructions below and you’ll be fine. Just take your time. Caramelizing onions takes a while, just go with it. And they keep for days in the fridge. Start by caramelizing the onions. Heat 2 tablespoons of the butter in a large saute pan over medium-high heat. When it’s hot, add the onions and toss to coat. Cover the onions, turn the heat down and cook slowly, stirring once in a while. You are looking for them to slowly soften and brown, not scorch on the edges. After 10 minutes or so, they’ll start to get soft. Sprinkle salt over them and let them cook some more. When they are just starting to brown, add the thyme and honey. Cook until they are a nice brown. Remove and set aside. The onions can be made in advance. While the onions are cooking, take the venison out of the fridge and salt it well. Let it come to room temperature the whole time you are cooking the onions; this is especially important if you are using elk or moose backstrap, which is thick. When the onions are done, wipe out the pan and add the remaining butter. Pat the venison dry with a paper towel and sear it over medium-high heat, turning it to make sure all sides are well browned. Use the finger test for donenessto determine when to take it out of the pan. Let the meat rest on a cutting board. If you have some, roll the venison in the porcini powder as it rests. 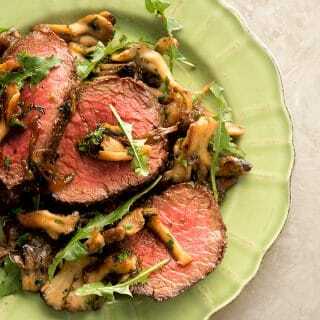 While the venison is resting, put the mushrooms in the pan and turn the heat to high. Sear the mushrooms until they release their water; this might not happen with hen of the woods. When the water has almost boiled away or when the mushrooms begin to brown, add some more butter and saute hard until the mushrooms are nicely browned. Salt them as they cook. Once the mushrooms are ready, add back the caramelized onions and the parsley and toss to combine. Heat through and put some on everyone’s plate. Add the dandelion leaves if you are using them. Slice the venison into medallions and serve. I’d serve this with potatoes of some kind, good bread — black pumpernickel is especially good — or polenta. You’ll want a nice red wine, too, or maybe a pale ale or Scottish ale.